We’ve written time and again about the rampant left-wing bias being displayed by the so-called “mainstream media,” or as we prefer to call it, the “Democrat-media complex.” Now a series of billboards are mocking the relationship between the media and the campaign of “crooked” Hillary Clinton, perhaps the most evil and diabolical person to ever run for President. 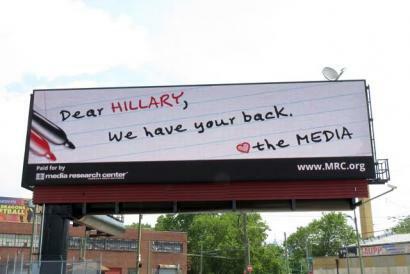 The billboards, courtesy of the Media Research Center, read: “Dear Hillary, We have your back.” They’re signed, “The media,” preceded by a heart. “The media’s love affair with Hillary will reach its apex this week in Philadelphia. They have been in the tank for her since the beginning. We can safely predict that at the Democratic National Convention they will need smelling salts to recover from their fainting spells. “The Media Research Center is not going to allow the media to coronate Hillary without a fight. We intend to show all of America their role in propping up, promoting, and defending the most corrupt person to ever receive a major party’s nomination. From Benghazi to illegal Clinton Foundation donations to criminally-dangerous misuse of classified information, the media have held Hillary’s hand every step of the way and they ought to be ashamed. It’s time they started to report the truth. “It’s very simple: Cover Clinton like you’re covering Trump. Nothing more, nothing less. According to Newsbusters, the MRC plans to place a total of six billboards in Philadelphia positioned along I-95 between the airport and the arena, and also south of the airport for people driving up from DC; also in the vicinity of the arena. They also plan mobile building projections, 100 sidewalk graphics, over 21,000 taxi TV ads and 175 taxi top ads at a cost of about $200,000. We’ve already seen examples of the blatant bias exhibited by the media this campaign season and no doubt, it’s only going to get much, much worse.